Check out our all-new upcoming events in the Events tab! Little Sunshine Music is proud to participate in the national movement encouraging the support and love of music to adults and children. Join us for a free class on March 19 at 11:00 AM. Limited to 10 spots. Please click below to register for the class! Registration for Summer Camps in now available! 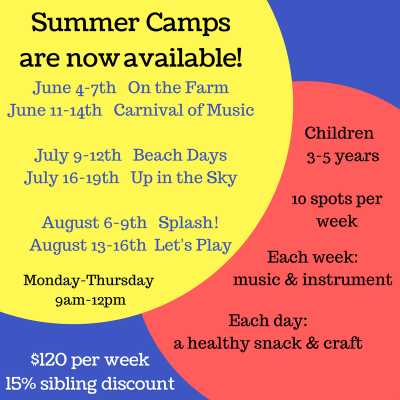 All Summer Camps will be for 3 - 5 year olds. The classes will last from 9:00 - 12:00 Monday through Thursday for the chosen week. Each week is a different theme, so you get to choose what your camp will be about. Registration is $120 for the first child, with a 15% discount for any siblings that also sign up. Click here to Enroll in Camp! We've updated our classes policy. Now, the flat rate of $70 per month will get you as many classes as you can attend! To take advantage of this exciting new policy, you will still need to sign up for a regular weekly class you plan on attending. 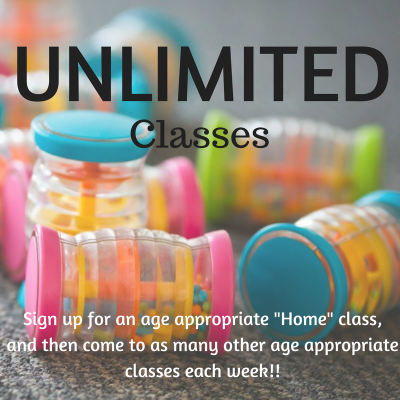 However, once you have signed up for a regular class, you can then use the "Make Up Scheduler" to pick any additional classes you'd like to go to, without restriction (as long as they aren't full and are age appropriate). 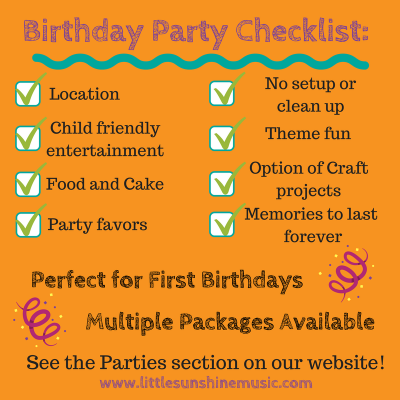 Visit the Parties page at the top, to see the different packages and add ons.